Last summer, I was helping my mom garden some of the beds in the back of her house when we stumbled upon something that looked too amazing to be true. A gorgeous Reishi mushroom was growing on the stump of a hemlock tree underneath the fence between her and her neighbor’s yard! You know, Reishi, the “king of herbs” in Chinese medicine? Scientifically known as Ganoderma and believed by ancient Taoists to be a core ingredient in the elixir of everlasting life? Yup, right there in my mom’s quaint little yard about 60 miles outside of New York City. I had heard there were some great mushroom harvests to be had in the woods north of her home, but finding one in her shrubs was definitely unexpected. The simple lesson here is that we don’t need to go far to find the medicine. We fall into the habit of thinking that the transformation or wild prescription for us exists in an exotic location “elsewhere,” but oftentimes they can be found right under our noses if we just open our eyes and take a look. Below, I’ve shared 9 common low-growing medicinal herbs and 1 mushroom that you may want to search for in your own backyard or surrounding neighborhoods – plus, we’ve also noted which regions they can be found in. This is a good reason to keep your backyard chemical-free—and of course make sure you wash everything thoroughly before preparation and consumption. Since some of these herbs have potent effects, so be sure to look up any potential contraindications with regard to pregnancy, allergies, ailments, or other medications you may be taking. You may want to do additional research on those edibles you do find in your own backyard, to see if they align with your personal needs. And perhaps you have something growing in your yard that’s not on this list. Take it to your local nursery for help in identification. With a little research, you can discover whether or not that plant has properties worth using, or if it’s one to avoid. Broadleaf Plantain (Plantago major): Unlike the large plantain trees that grow delectable fruits, the broadleaf plantain is a ground cover. Packed with Vitamin K, calcium, and other vitamins and minerals, the broadleaf plantain has a cleansing and detoxifying effect on the body. This medicinal plant has been used in treating colds, diarrhea, burns, open sores, wounds, mouth ulcers, boils, acne, throat pain, sunburn, fever, respiratory infections; improving liver and kidney function; relieving gastrointestinal inflammation; and drawing out poisons and toxins from bites and stings—even snake bites! It’s often used as an anti-inflammatory and an analgesic, and you can make it into a tea, poultice, or salve. Where it grows – North America, Europe, Australia and Asia. Burdock (Arctium lappa): Burdock Root is an antioxidant powerhouse and has been used in Chinese Medicine for thousands of years. Some of its traditional uses include removing toxins from the blood, inhibiting certain types of cancers, treating skin issues, and acting as an aphrodisiac. It’s also a natural diuretic, so be sure to hydrate properly. Consume in moderation. Consider trying in a tea, fresh root form, or dried root powder. Where it grows – North America, Europe, Australia and Asia. Chickweed (Stellaria media): Chickweed is known as a natural skin rejuvenator, with both cooling and drying effects on wounds, sores, minor burns, acne, eczema, psoriasis, and other skin inflammations. It has also been used for constipation and relieving irritated eyes. 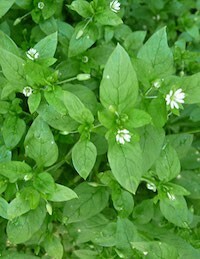 Chickweed is a rich source of Vitamin C and potassium, and also provides nutritious trace vitamins and minerals. It fell out of style as a popular salad green, so you may want to try it that way first, or perhaps make chickweed vinegar by infusing it with apple cider vinegar. For topical use, create a salve from the plant’s essential oils. Where it grows – North America, South America, Central America, Europe, Australia and Asia. Dandelion (Taraxacum officinale): Perhaps the most prolific and recognizable, the dandelion is greatly undervalued. This beneficial plant is often found in some of the finest herbal teas, and is used for its healing benefits to treat high blood pressure, calcium deficiency, cancer, diabetes, diverticulitis, irritable bowel syndrome, urinary tract infections, and eczema and psoriasis; detoxify the liver; aid digestion; and reduce inflammation. Use in salad greens, or dry the leaves and roots to make a tea. Where it grows – North America, South America, Central America, Europe, Australia and Asia. 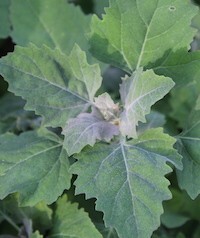 Lamb’s Quarters (Chenopodium album): This “prince of wild greens” is a common garden weed packed with enough protein to rival spinach, along with Vitamins A and C, calcium, phosphorous, iron, and a multitude of minerals. Our ancestors prized this plant’s medicine for its purification properties to “improve the blood,” and also to treat rheumatism and arthritis, toothaches and tooth decay, constipation, insect stings, eczema, and gout. Keep seed consumption to a minimum, but freely consume the leaves, shoots, and flowers. Eat fresh leaves and flowers mixed in with your other salad greens; steam or stir fry along with your favorite vegetables; or cook and puree with some of your favorite soups. You can also grind seeds into flour. Where it grows – North America, Europe, Australia, Africa and Asia. Reishi Mushroom (Ganoderma lucidum): If you are fortunate enough to live in an area where the reishi grows, you may already be aware of its long-touted healing properties. Mainly used in prevention of disease, the reishi offers protection against inflammation, various infections, skin disorders, diabetes, heart and liver disease, sleep disorders, digestive problems, cancer, fatigue, anxiety, depression, and viruses, including HIV/AIDS and hepatitis. It also helps to restore hormonal imbalance, and regulates various cellular functions. Because of its slightly bitter flavor, it’s traditionally dried and then prepared for a tea, or pulverized into a powder and mixed into your favorite protein shake. Where it grows – Eastern North America, South America, Europe and Asia. Stinging Nettle (Urtica dioica): Be careful—this herb can sometimes “sting” and leave a rash when bare skin comes into contact with the acid-filled needles. Once boiled, however, the nettles leave you with leaves that, when ingested, provide nutritious elements and anti-inflammatory properties. Nettle leaves have been used in treating allergy symptoms, lowering blood pressure, improving immune system response, reducing pain, acting as a diuretic, treating skin conditions, thickening hair while also reducing dandruff, and causing a sedative effect. The plant’s root has been used to address prostate concerns in men. 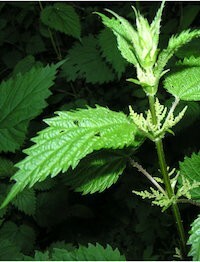 Handle and harvest while wearing gloves, and then boil or cook to remove the sting from the nettles. The easiest and perhaps most common way to use nettles are in a tea, where you can flavor with other herbs or spices to taste. But once cooked, you can also use nettle leaves like most other greens and use in salads, or season and bake them (like kale chips), or grind to make a pesto. For the roots, toss them in a stir fry or dry like the leaves for use in a tea. Where it grows – Western North America, Europe, Northern Africa and Asia. Purslane (Portulaca oleracea): Purslane is an excellent source of fiber; Vitamins A, B, and C; iron, calcium, magnesium, manganese, potassium, copper, and powerful antioxidants. Our ancestors have used it for hundreds of years to prevent and cure disease. It’s been used to treat high cholesterol, diarrhea and other gastrointestinal disorders, skin conditions, and cancer. It’s believed to improve vision, strengthen bones, increase circulation, and aid in weight loss. Try it mixed with salad greens. Where it grows – North America, South America, Central America, Europe, Africa, Australia and Asia. Red Clover (Trifolium pratense L.): Menopause symptoms. Maintaining bone strength. Improving cardiovascular health. Lowering risk for various types of cancers. Reducing skin inflammation. Fighting respiratory infections. Detoxifying the liver. Boosting the immune system. Managing cholesterol. Balancing hormones. These are just some of the many disorders and “symptoms of aging” that red clover has been used to treat. Dry the herb to make a tea, or make a salve for a topical medicine. Where it grows – North America, South America, Central America, Europe, Australia and Asia. 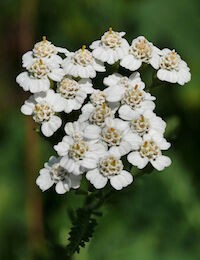 Yarrow (Achillea millefolium): This pretty little flowering herb is wonderful for healing skin conditions; stopping bleeding (external); encouraging bleeding in cases of amenorrhea; alleviating anxiety; acting as a mild sedative; reducing inflammation; and treating mastitis, high blood pressure, asthma, and muscle spasms. Use fresh leaves in salads, soups, or sautéed dishes, or use dried leaves as a cooking herb. Where it grows – North America, Europe and Asia. This is great information – thank you. I’m very inspired as I let my garden go wild, and now found oregano and wild strawberries growing – a perfect gift. Always a little concerned about identifying mushrooms though……. Thank u.. Very helpful ???????? Thank you for sharing your beautiful, important and health sustaining wisdom. I would add the common pigweed, sometimes called redroot, that grows abundantly in many cultivated fields. Its leaves are not as colorful as its caribbean cousin, callaloo, but it’s just as delicious. I have not researched it’s constituents, but it is so delicately delicious that it just feels healthy. Lightly steamed and dressed with olive oil, salt, pepper, a little lemon or vinegar maybe, it is a culinary treat not to be missed! Thank you for this information. Do you have a list of medicinal and edible plants that can be found in southern United States,? I live in Florida and would like to recognize the plants specific to my region. Thank you, Nick. I’d been eating some of these as pot herbs without realizing they have medicinal value, too. For the reader from Florida–most of these grow here. eattheweeds.com has a wealth of information and addresses both culinary and medicinal uses. Thank you for all the information about the possible use of herbs. I have lyme disease and just started using a homemade reishi tonic. I will let you know how it is improving my condition. I know some mushrooms are poisonous so i stay clear of them. I think I ha e seen Reishi but did not know it. If thais how theylook I will be onthe lokout for them in my area. WATCHED A PROGRAM ON WILD MUSHAROOM ,SAW PEOPLE PICKING OUT OF FIELDS. Mahalo so much for this Amazing and Critical contribution to Hamanity ! I am now finally delving into my Ancestors realms of Plant healing and Medicine. I am mixed with a rich cultural background of Hawaiian, California Native, Northern African, Gypsy, and more…. It is time for is to learn and use what is offered as gifts to help us on our journeys. Mahalo for your journey….It is making a difference. PS. Despite my email having uk at the end, I live in Cape Town. Also most of these grew in my garden in Harare, Zimbabwe when I lived there. I want to get information about (Ganoderma fungus) and planting and planting it. Thanks for sharing this important information with humanity. Clearly the answer is all around us, in the nature. Just need to take the time and search for it. Thanks again for reminding us! In 2014 after the smart meter installation, my health decreased tremendously and became electrosensitive. The one thing that helped me most was the Dynamic Neurofeedback and therefore after herbs, and detox. I am not 100% but close. If any recommendation, I remain open. Thanks & Blessings! Your on-line video series is potentially world shaking. I want to send you a private message about an idea I have for your work. Would you mind sharing an email address so i could send the letter to you?